Reading Transport Optare MetroRiders After RTL: 624 has passed from Ensign (dealer) to MANN, Gravesend where it joins former 190 and 191. Weavaway Travel Fleet List: The registration of the new Plaxton Cheetah is YN06 CYX not CVX. Thanks to Tom Male for this. Oxford Bus Company Fleet List: 620 has received a new ColourBus livery for Oxford Inspires on top of the new Oxford Bus Company livery. 412 and fire damaged 612 are withdrawn for sale following the loss of routes 14 and 16. 603-5/7 were also to be withdrawn, but are being retained at least for the summer. Stagecoach in Oxfordshire and Warwickshire Fleet List: Officially withdrawn 20417 and 41505 are actually still in service at Rugby. Thanks to Timothy Warneck for this. The new crew vans at Oxford have been allocated fleet numbers 92902-4 in delivery order (OV06 UPP/URZ, OE06 DFX). Meanwhile 91610 was written off following an accident in November 2005. Stewarts of Mortimer Fleet List: Delivered today is new Mercedes-Benz 0814D / KVC SN06 KPR. T894 JVR has been withdrawn and is awaiting spare parts before sale. Thanks to Derek Bradfield for this. Stewarts of Mortimer: New photo of SN06 KPR added. Thanks to John Wheeler for this. Stagecoach in Oxfordshire and Warwickshire Fleet List: Nuneaton 18502-5 were exchanged with Stagecoach South for 34641-4 yesterday, with 34641-4 entering service today. Thanks to Tim Moss for this. The third van for Oxford has now arrived registered OE06 DFX. Reading Transport Fleet List: Ancillary vehicles 306 and 350 have been withdrawn, although 306 may only be awaiting parts before returning to work. 632 has transferred to Reading for use on driver route familiarisation and driver shuttle duties, and additionally has been in use on a private hire for a youth project for the past two weeks. 502/7 remain at Reading under repair - 502's last day in service probably being 12th May and 507 sometime in January. 942 is currently at Reading under repair following an accident on 6th June. Thanks to Brain Coney for this. Reading Transport MegaRears: 704 has also received the Oracle (Fashion & Taste) MegaRear in place of its one for Westbury Homes. Thanks to James Cusworth for this. Burghfield Mini Coaches Fleet List: New is LC02 RJC a Mercedes-Benz 1223L / Ferqui from Clayton, Burnopfield. TJI 6307/8, G705 XLY, H658 DKO, K809 PLM, M86 TAK, and V410 FBK are all withdrawn and in varying states of cannibalisation. Previously withdrawn DYA27/49A, G703XLY, G674LYP are also still present being cannibalised. Thanks to Derek Bradfield for this. Woodley Travel Fleet List: New are X372 HCT a Mercedes-Benz 0814D / Autoclasique from Browne, Yiewsley and W234 KDO a Mercedes-Benz 01120L / Ferqui from Warrington, Swanmore. TIL 2576, M653 SBL have been withdrawn and sold. Thanks to Derek Bradfield for this. Stagecoach in Oxfordshire and Warwickshire Fleet List: 18502/3/5 have lost their route 157 branding. Thanks to Tim Moss for this. Oxford 42376/586/588 were withdrawn as planned and have transferred to Stagecoach West. Meanwhile Oxford 42383 has moved to Banbury also as planned leaving Banbury 42624 ready for disposal. Rugby 20417 is also confirmed as withdrawn, whilst 13626 is confirmed staying at Nuneaton rather than moving to Rugby. Reading Transport Fleet List: Fleet list converted into Microsoft Excel format. Comments welcome. Reading Transport Former Vehicle Fleet List: Fleet list converted into Microsoft Excel format. Comments welcome. Horseman Coaches Fleet List: The South Wales dealer that S608/9 VAY and T866/8/9 JBC were sold to turns out to be Byron John. All have passed to Lang & Evans, Abercraf to join S610/1 VAY. Thanks to Buses magazine for this. Baileys of Newbury Fleet List: A8 BHC has been reregistered back to L384 RYC and sold to Plaxton (dealer), whilst LV02 LLN has received the A8 BHC mark instead. New additions via Plaxton (dealer) are Iveco Eurorider / Beulas Stergo 'e' FG03 JAU/JCU from Woottens, Chesham. JCU was reregistered K80 BLN today. Thanks to Derek Bradfield for this. Reading Transport Fleet List: 501, 503, 505, 506, 507 and 508 passed to Ensign (dealer) on either 7th or 9th. 109 is confirmed as still having its Vodafone Hot Properties MegaRear. Reading Transport Vehicle Types: Totals updated to 195 vehicles (131 Reading, 36 Newbury, 28 Goldline) plus 4 to be withdrawn from Reading. Reading Transport Leyland Olympians: (3)11 and 12 passed from Ensign to Whippet Coaches, Fenstanton on 13th. A start has been made to repaint (3)11 whilst 12 entered service in full Reading Buses livery yesterday. Thanks to Dave Harmsworth for this. Reading Transport Newbury Buses Vodafone Services: NEW PAGE! detailing as much of the Vodafone route history as could be pieced together from reports on this site over the years. Any further information would be welcome. Stagecoach in Oxfordshire and Warwickshire Fleet List: 18502-5 are to be swapped for 34641-4 from Stagecoach South. Thanks to Tim Moss for this. 20011 is confirmed at Witney. Reading Transport Fleet List: 701 was reregistered J257 NLU yesterday, whilst 828 has received the MRD 1 plates in its place. Thanks to Brain Coney for this. Reading Transport Fleet List: 928 is the Excel with the new MegaRear for Ascot Races. Thanks to James Cusworth for this. 501/2/4 are reported by Ensign as having arrived with them by 11th, although from other sightings it actually looks like it was 503/5/6 - 504 was still in service in Newbury today. Reading Transport MegaRears: At some point 120 and 121 have lost their Vodafone Hot Properties MegaRears in favour of Vodafone 'now' adverts that are also currently worn by 970-1/3 (972 is blank). Unconfirmed are 109 and 942, 109's was still in place on 3rd December 2005 having transferred to the town fleet in October. Weavaway Travel Fleet List: C4/6-8 OXF are now confirmed as having arrived, whilst C1 OXF is expected next week. C3-7 OXF have been upseated to C57F whilst the other two remain C55F. B10 MKF passed to Allander Milngavie on 11th. B10 MBD is now with Ensign (dealer) having returned from Southdown PSV (dealer). Thanks to Derek Bradfield for this. Stagecoach in Oxfordshire and Warwickshire Fleet List: Nuneaton 18502-5 are to be transferred elsewhere in exchange for a number of Darts from 23rd July when route 48 is being extended to Leicester. This is in addition to the exLondon Darts currently being converted and a batch of new Darts due for Leamington later in the year. Reading Transport Fleet List: 508 was withdrawn and transferred to Newbury on 5th or 6th in exchange for 515. 506/10 went to Reading on 30th May in exchange for 520, and 505 on 1st June in exchange for 513. 108 received a new MegaRear for Ascot Races on 2nd June replacing its one for the Oracle. It's not confirmed whether its Oracle rear remained in place until this date. 111 has recently lost its MegaRear for Newbury Buses 'Your route to a brighter future'. Thanks to Brian Coney for this. One of the Reading Excels has also received the new MegaRear for Ascot Races. Thanks to James Cusworth for this. First Berkshire Fleet List: 64815 has received a new MegaRear for Ascot Races in place of its one for Go Shopping @ Bracknell. Thanks to James Cusworth for this. Thames Travel: The fleet numbers of 106 and 406 are the opposite way around to that previously reported, the numbers having been allocated in order of arrival rather than alphabetically. Weavaway Travel Fleet List: OU05 KLA/KKB have transferred to Culham, whilst C7/8 OXF also appear to have arrived. Thanks to Richard Sharman for this. Pending the delivery of the remaining VanHools YN55 PZS/PZT, WA05 DFG and WA06 GSV are also on location temporarily - reports that these are permanent allocations are incorrect. Weavaway Travel Fleet List: N170 AAG has now arrived from Holeswood registered C5 OXF. Thanks to Derek Bradfield for this. Reading Transport Fleet List: 706 has a new MegaRear for the Oracle in place of its one for Westbury Homes. Thanks to John Wheeler for this. Reading Transport Fleet List: 515 was in service at Newbury by 7th. Thanks to David Wilder for this. Courtney Coaches Fleet List: Y812 KDP has passed to Roadliner, Poole for operation on a new service being trailed for three months. The vehicle may only be on loan from Courtney for this period, although it does join former Courtney Y811 KDP which was acquired by Roadliner in February. Thanks to Graham White for this. Weavaway Travel Fleet List: The new Abingdon depot is in fact in Culham, not very far from Whites Coaches. Two Volvo B9TLs were noted in residence on 6th. Stagecoach in Oxfordshire and Warwickshire Fleet List: 47315/6 both entered service yesterday as expected. Also over the weekend 20542/3 finally moved from Witney to Oxford with 20009/10 going to Witney in return. 20011 should also have transferred to Witney, but has not been confirmed yet. Thames Travel Fleet List: The new Esteems are numbered 106, 206, 306, 406 and are B31F. 106 has also now been delivered and was in service by 2nd. Reading Transport Fleet List: Exact dates for the recent transfers to Newbury are 512/8 on 23rd May, 519 on 24th May, 520 on 30th May and 513 in the last few days. 503/7 were withdrawn and moved to Reading on 23rd May, 501 on 24th May and 505/6/10 in the last few days. 504/9 are expected to remain at Newbury until the last Deltas can be transferred from Reading. Thanks to Brian Coney for this. 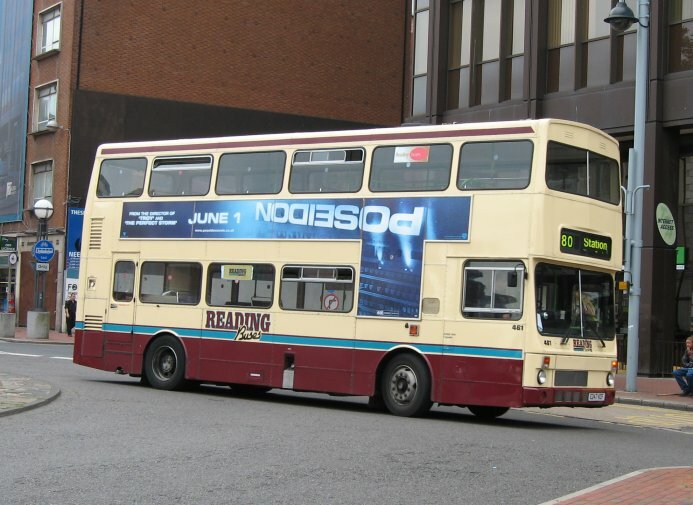 514/5/7 are still active at Reading, and at least two Deltas will be required at Reading until 17th July when a route variation comes into force around Sonning Common where Excels currently can't operate due to grounding issues. 520 has been fitted with Bright-Tech destination displays. The incorrect fleet numbers applied to 465 last week (456) were swiftly rectified. Stewarts of Mortimer Fleet List: Loan FX03 GKY is C29F. The new 24 seater is now expected in the next week or two. Thanks to John Wheeler for this. Stagecoach in Oxfordshire and Warwickshire Fleet List: An additional vehicle for Megabus at Rugby is 52601 from Chesterfield, whilst 52446, 52617/23 should also have arrived. 52654 is confirmed as being withdrawn, but its new location is still unknown. The fleet number of RN05 ODR is corrected to 90030 (not 90036) and the registration number of 95095 is corrected to HN05 SRO (not MN05 SRO). Thanks to Tim Moss for this. 22209 is confirmed as still having route 1 branding. Reading Transport Fleet List: 518 has now transferred to Newbury. Thanks to James Cusworth for this. Stagecoach in Oxfordshire and Warwickshire Fleet List: National Express 52641/2/3/5/7/57 transferred from Rugby to Nuneaton from 14th May. 52654 appears to have been withdrawn or transferred somewhere else. Meanwhile 52446 is expected from Chesterfield and 52617/23 from Leyton to increase Megabus operations from Rugby. Oxford 22057 has received route 1 branding, whilst 22209 should be loosing it if it hasn't already lost it.